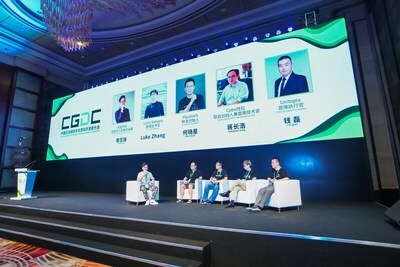 BEIJING, Aug. 10, 2018 — (PRNewswire) — At the China Game Developers Conference (CGDC) held in Shanghai on August 2-3, PlayBlock co-founder He Xiaoxing attended a special roundtable dedicated to the discussion of the development of blockchain-based games: the China Blockchain Technology and Game Developers Conference. Mr. He's contribution to the discussion focused on what he saw as the three major elements for the success of such games. The latest data shows that the market value of the world's digital currency has now reached approximately US$300 billion, while the number of digital currency users worldwide is currently in the environs of 20 million, accounting for only a mere half of one per cent of the world's four billion internet users. The vast majority of cryptocurrency holders can only trade with others for lack of practical application scenarios. How to engage more users via the Internet is the challenge being faced by developers and one that lends itself particularly well to a solution through the relatively recent appearance and rise of the blockchain. Although fraught with controversy following the emergence of some new games, among them CryptoKitties and Fomo3D, games are actually an area that is very compatible with and easily integrated into the blockchain sector. Commenting on the future of the sector, Mr. He said, a successful blockchain game needs to deliver a good user experience and have an appealing theme, while being highly innovative in terms of the technology. Interesting and appealing content is the way to constantly attract new users, while a good user experience is what will be necessary to retain them. By relying solely on a decentralized blockchain server set up, the relationship within the game can be completely reconstructed. As the environment will continue to mature, ever more interesting and technologically advanced blockchain games can be expected to continue to emerge in the market. 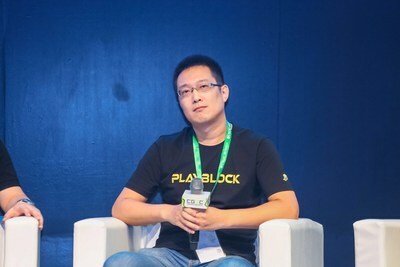 Hello, everyone, I am He Xiaoxing, co-founder of PlayBlock, a firm that specializes in entertainment-oriented content on the public blockchain. I have some opinions to share with you on the topic of the development of the recent batch of highly popular blockchain games. Firstly, let me introduce our team. The PlayBlock team consists mainly of application and product developers who graduated from Tsinghua and Peking universities and have over ten years of experience. The key team members began to engage in the research of blockchain technologies in 2013. They designed and led the publication of a top game title boasting over 300 million registered users and accumulated revenue exceeding 15 billion yuan (approx. US$2.2 billion), created a highly collaborative development team of over 100 professionals as well as addressed a challenge involving more than 5 million players on the same server. With years of experience in blockchain technologies, the team developed their first public blockchain in 2017. The current transaction processing capacity for Bitcoin is 7 transactions per second (TPS), while Ethereum can handle 25. Neither of these capacities is anywhere near sufficient to support online games due to the high concurrency scenario. Additionally, the consensus mechanism for both Bitcoin and Ethereum is Proof-of-Work (POW), the drawbacks of which include the high level of energy consumed and the related cost. The game and other verticals are also in need of a public blockchain that meets the transmission rate and concurrency requirements of the products. Public blockchain platform PlayBlock worked with Tsinghua University's research team to create a new consensus algorithm based on the latest achievements in scientific research: the Gosig consensus protocol. The new consensus algorithm allows tens of thousands of nodes to participate in the consensus process on the public blockchain. In the simulation test conducted in May, the TPS of the public blockchain-enabled WAN exceeded 25,000, in addition to an improved balance between decentralization, security and performance, among other indicators. PlayBlock plans to continue collaborating with leading universities and colleges in and outside China with the aim of upgrading the underlying technologies. In August, we will announce a significant partnership with one of the top global research teams to push beyond the boundary of the public blockchain's performance. With the recent launch of CryptoKitties, Fomo3D and other prediction-based games, as well as other blockchain-based games that are receiving a lot of attention, industry players are especially interested in blockchain-based entertainment products and want to copy there seemingly successful ventures. However, I must throw cold water on the idea. The majority of the existing products that have attracted attention copy the model that was once popular in the internet scenario. A combination of the model and simple blockchain technologies was used to leverage market opportunities in a timely manner. During the 2018 FIFA World Cup, several blockchain teams rolled out products designed to predict match results, as a way of helping to verify and promote the value system of tokens. PlayBlock also rolled out a community decentralized application (DApp) Little P Tribe. In addition to allowing users to use tokens to participate in the prediction of FIFA World Cup results and in the mining activity, the DApp runs on a fully decentralized blockchain server. From opening Little P Tribe to giving a command, all the actions take place and are fed back to users on the blockchain server. Both the football match sessions and users' attempts at predicting the results are relatively centralized. Public blockchain professionals know that the high concurrency is a technical challenge facing the blockchain industry. We have optimized our technologies based on actual behavior. Compared to other products of its kind, we improved the engagement with the product by adding a live streaming highlighting interesting tidbits about local customs in Russia during the breaks in the FIFA World Cup quarter finals and letting audiences know the predictions being made by users. The content was recommended on the home pages of Huya.com and other live video streaming platforms. Over one million users participated in the predictions of game results. During the FIFA World Cup, we attracted over 10,000 new users with following-day retention of 80 percent and seven-day retention of 60 percent. After the FIFA World Cup, we added entertainment elements to the results predicted by users on Little P Tribe. In addition to sports, the application also provides comparisons of the Baidu Index for popular variety shows and artists as well as forecasts concerning the financial markets. The application continues to receive positive feedback from users by proactively interacting with users participating in a wide range of activities on the platform. While optimizing the product, we continue to create other attractive products by addressing the expectations of users, responding to market trends and providing user-generated predictions concerning many aspects of the future. In addition to the intensive efforts in developing the public blockchain, PlayBlock continues to expand the product range. Blockchain is an industry characterized by compositional competition. We affirm that a team without a deep understanding of the content cannot develop a successful blockchain project, while a team that is not tech-savvy cannot create good content. PlayBlock's development plan focuses on the launch of PlayBlock TestNet 1.0, a test network powered by PlayBlock's advanced consensus algorithm, within this year. PlayBlock also plans to form several partnerships in the pan-entertainment industry and cooperate with developers to explore the integration of decentralized applications into games, applications that involve user-generated predictions, copyright trading and other scenarios, which will help improve PlayBlock's entertainment content ecosystem. We can say that the blockchain changes the way that products are created and reflects the upper limit of the internet. However, currently, the huge potential of the blockchain remains unleashed. We welcome anyone who has a serious interest in blockchain technologies to join PlayBlock to create a richer blockchain-based entertainment experience. The above are some opinions shared by me, who has years of experience in internet products and is a newcomer in the blockchain industry.